Every year after Spring Break at The University of Texas at Austin, fraternities and sororities hold the biggest event of the semester: Roundup. Neon and fanny packs flood West Campus, leaving some students not involved in Greek life with burnt retinas and a feeling of being left out for not owning a sorority tank top. Last year was different. Emma Morris, a freshman not affiliated with a sorority at the time, decided she was going to tackle Roundup as an “independent” head-on, instead of avoiding the event completely. 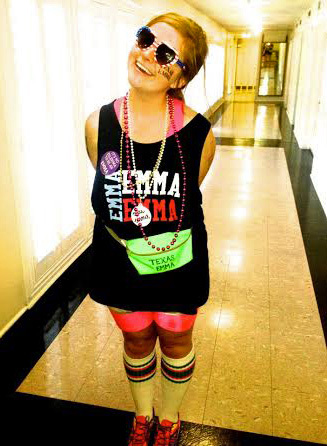 As her roommates placed orders for their newest sorority gear, Emma got online and began making her own brightly-colored tanks and knee-high socks. She impulsively confirmed her clothing on a DIY t-shirt site for her new mock sorority, which included her own fanny pack, t-shirts, shorts, necklaces and 60 stickers stamped with phrases similar to UT's sororities, such as “Round Up: I probably won’t rememma this." Tagging her name at the end of "Texas" like other sororities on campus, Texas Emma is now UT’s newest unofficial sorority, and anyone can buy the t-shirts. “I only had Texas Emma clothing for myself at the time, but I gave the stickers to everyone, which is what really got it started,” Morris says. 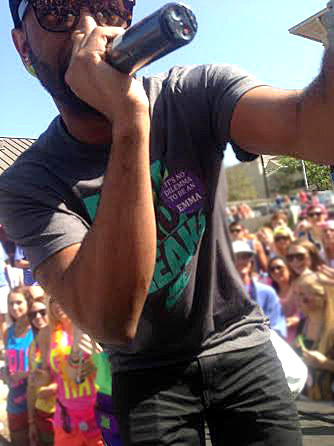 The stickers quickly spread throughout a concert at Kappa Sigma, and even the performer Chamillionaire and his entire crew wore “It’s no dilemma to be an Emma” stickers. “Everyone kept asking ‘What’s an Emma?’ I wasn’t even sure at that point," Morris says. The following semester, Morris rushed for a second time and joined a sorority, but it was not what she expected. She decided it was best to drop out of UT to pursue a career in motivational speaking. “I was originally a theatre major, but I realized it wasn’t for me,” Morris says. After trying to switch into Public Relations and being denied, she settled for a major in American studies. “I can’t even tell you what American Studies really is, but in my 10-year vision I didn’t want to have an office job, and I didn’t want to be rich,” she says. After dropping out and getting a full time job at Lululemon, she decided to turn back to Texas Emma again. “I just wanna be cute and fun and fun and cute," she says. Since Roundup, the Texas Emma brand has expanded to its own website, where Morris intends to post a series of web-isodes, and Roundup attendees can buy Texas Emma gear on the site. Emma hopes that her alternative to Greek clothes will encourage more non-greek students to attend Roundup. Texas Emma has even had a round of pledge applicants. As for her web series, the vlog will feature Morris interviewing random people around Austin about various topics. “Surprisingly, it’s extremely difficult to find people to say stupid and non-serious things. I have to ask like 400 people questions to get one good response," she says. Morris hopes that Texas Emma will grow into something that will feed into her career as a motivational speaker, sharing things she wishes other people had told her when she was in high school or middle school. “It sounds like I’m just a really big narcissist by putting my name all over things, which is what it is right now,” Morris says. Next year, Morris will go to 11 countries in 11 months. She plans to take Texas Emma abroad, interview random people in various countries and share their opinions on subjects. Eventually, she would like to hold Texas Emma fundraisers and possibly sponsor charity events. “Whatever I do in life, I want good to come out of it,” Morris says.